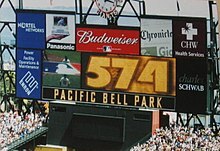 The 2002 San Francisco Giants season was the 120th in franchise history, the franchise's 45th season in San Francisco, and their third in Pacific Bell Park. The season ended with the Giants winning the National League pennant but losing to the Anaheim Angels in the 2002 World Series. The Giants finished the regular season with a record of 95–66, ​2 1⁄2 games behind the Arizona Diamondbacks in the National League West standings. By virtue of having the best record among second-place teams in the National League, they won the NL wild card to earn a postseason berth. In the postseason, the Giants faced the Atlanta Braves in the National League Division Series. After being brought to the brink of elimination, the Giants won Games 4 and 5 to clinch the series, three games to two. They went on to defeat the St. Louis Cardinals in the National League Championship Series by a series score of four games to one to win the franchise's 17th NL championship and its third in San Francisco. Then, in the World Series, they brought the Angels to the brink of elimination before the Angels came from behind to win Games 6 and 7. 2002 was manager Dusty Baker's tenth and final season managing the Giants. Following the season he departed to manage the Chicago Cubs. November 28, 2001: Wayne Gomes was released by the San Francisco Giants. December 16, 2001: Tsuyoshi Shinjo was traded by the New York Mets with Desi Relaford to the San Francisco Giants for Shawn Estes. December 18, 2001: Jason Schmidt was signed as a Free Agent with the San Francisco Giants. January 25, 2002: David Bell was traded by the Seattle Mariners to the San Francisco Giants for Desi Relaford and cash. Barry Bonds passes Harmon Killebrew for seventh on the all-time home run list on May 13, 2002. June 4, 2002: Matt Cain was drafted by the San Francisco Giants in the 1st round (25th pick) of the 2002 amateur draft. Player signed June 26, 2002. San Francisco won 4-3 at Edison International Field of Anaheim (now Angel Stadium of Anaheim) to take a 1-0 lead. Barry Bonds hit a home run in his first career World Series at-bat. He was one of three Giants to homer in the game (the other two were Reggie Sanders and JT Snow). Troy Glaus hit 2 home runs for the Angels. Anaheim won 11-10 at home in a game where the lead kept fluctuating between the two teams, tying up the series. Bonds again hit a mammoth homer with 2 outs in the 9th inning, off of Troy Percival. The biggest home run of the night, however, was hit by Tim Salmon, a longtime Angel, with 2 outs and one on in the bottom of the 8th. The dramatic blast won the game for the Angels. Anaheim won 10-4 in the first game at Pacific Bell Park (now AT&T Park). The Angels batted around twice without a home run in either of their 4-run innings. Barry Bonds hit another home run, becoming the first man to homer in his first 3 World Series games. San Francisco scored a 4-3 victory to tie the series. NLCS MVP Benito Santiago tied the game with a single in the 5th inning after the Angels walked Barry Bonds with a runner on second and two outs. David Bell put the Giants ahead with an RBI single in the bottom of the 8th. The run was unearned due to Anaheim catcher Bengie Molina's passed ball during the previous at-bat, allowing J. T. Snow to move to second. San Francisco took a 16-4 blowout win in a game in which the Angels never led. The most well-known moment in this game occurred when Giants first baseman J. T. Snow scored off a Kenny Lofton triple. 3-year-old batboy Darren Baker, son of Giants manager Dusty Baker, ran to home plate to collect Lofton's bat before the play was completed and was quickly lifted by the jacket by Snow as he crossed the plate, with David Bell close on his heels. Had Snow not acted quickly, Darren could have been seriously injured. The turning point in the series came in Game 6. Leading 5-0 with one out in the bottom of the 7th inning, 8 outs away from the Giants' first World Series title in San Francisco, Giants manager Dusty Baker pulled starting pitcher Russ Ortiz for setup man Félix Rodríguez after Ortiz gave up consecutive singles to third baseman Troy Glaus and designated hitter Brad Fullmer. In a widely publicized move, Baker gave Ortiz the game ball as he sent him back to the dugout. During the pitching change the Rally Monkey came on the JumboTron, sending 45,037 Angels fans into a frenzy. Angel first baseman Scott Spiezio came to the plate and fouled off pitch after pitch before finally hitting a 3-run home run that barely cleared the wall in right field. The rally continued in the 8th inning, as Angel center fielder Darin Erstad hit a leadoff line-drive home run, followed by consecutive singles by Tim Salmon and Garret Anderson. (Chone Figgins pinch ran for Salmon.) When Bonds misplayed Anderson's shallow left field bloop single, Figgins and Anderson took third and second respectively. With no outs, two runners in scoring position and now only a 5-4 lead, Baker brought in closer Robb Nen to pitch to Glaus, hoping that Nen could induce a strikeout that might yet preserve the Giants' slim lead. However, Glaus slugged a double to the left-center field gap over Bonds' head to drive in the tying and winning runs. In the 9th inning, Angels closer Troy Percival struck out Rich Aurilia to preserve the 6-5 victory in front of the jubilant home crowd. Game 7 proved to be somewhat anticlimactic after the drama of Game 6. The Giants scored the first run on a sacrifice, but the Angels responded with a run-scoring double from catcher Bengie Molina and a 3-run double to right field from left fielder Garret Anderson to open a 4-1 lead. Rookie starting pitcher John Lackey maintained that lead. In the 9th inning, closer Troy Percival provided some tense moments as he opened the inning by putting two Giants on base, with only one out. But Tsuyoshi Shinjo – the first Japanese player in a World Series game – struck out swinging, and Kenny Lofton, also representing the tying run, flied out to Darin Erstad in right-center field to end the Series. The Angels won Game 7, 4-1, to claim their franchise's first and so far only World Series Championship. John Lackey became the first rookie pitcher to win a World Series game 7 since 1909.